Point Co-Processor, Rigid Tapping, 4mb Expanded Memory, Programmable Coolant Nozzle, Coordinate Rotation and Scaling, Macros, Quick Code, Chip Auger, 18” x 48” Table, Coolant. SNK FSP-100V CNC Vertical Machining Center s/n 8036068 w/ Fanuc 0M Controls, Fanuc mdl. TV330B Tracing Head, 50-Taper Spindle, 3000 RPM, 36” x 157” Table. Makino Type MCP-100 4-Axis CNC Horizontal Machining Center s/n C43-24 w/ General Numeric GN6 Series Controls, 22” Rotary Table, 40-Taper Spindle, 20” x 63 ½” Secondary Top Table. Takisawa MAC-V3 CNC Vertical Machining Center s/n TMELX3098 w/ Fanuc System 6M Controls, BT-40 Taper Spindle, 16” x 23 ¾” Table, 16” x 36” Top Plate, Coolant. Okuma LB10 CNC Turning Center s/n 6107-1633 w/Okuma OSP5000L Controls, 12-Station Turret, Tailstock, 7” 3-Jaw Power Chuck, 3-J Collet Nose, Coolant.Mori Seiki TL-3 CNC Turning Center w/ Mori-Yasnac 2000B Controls, 8-Station Turret, 10” 3-Jaw Power Chuck, Chip Conveyor, Coolant. OPG “Di-Metric Plus” mdl. OQ-20 20” Optical Comparator s/n 00200308 w/ OPG Controls, 10X, 20X, 50X and 100X Lenses, 8” x 32” Table. Sanei mdl. FMP-550 20” Floor Model Optical Comparator s/n 1795 w/ Surface and Profile Illumination, 10X and 20X Lenses. Microflat 72” x 118” x 14” 2-Ledge Granite Surface Plate w/ Stand. Mitutoyo CX-652E Bench Model CMM Machine s/n 7059 w/ X=24”, Y=28”, Z=10”. Brown & Sharp Micro-Hite Digital Height Gage. Mitutoyo 40” Dial Height Gage. Mitutoyo 60” and 30” Vernier Caliper. Mitutoyo and Enco 6”-12” OC Mic Sets. Mitutoyo 2”-3”, 1”-2”, 0-1” Thread Pitch Mics. Mitutoyo 7”-8”, 6”-7”, 5”-6”, 4”-5”, 3”-4”, 2”-3”” ID Mics. Mitutoyo 1.4”-2.4” and .7”-1.4” Dial Bore Gages. SPI 1.4”-1.6”, .8”-1.0” Bore Mics. Fowler 2”-6” Dial Bore Gage. Sunnen and Federal Dial Bore Gages. Intertest 2.8”-3.6”, .8”-1.6”, .4”-.8” Dial Groove Gages. Mitutoyo 0-3” Dial Depth Gages. New Age Portable Hardness Tester. Approximately 30,000 Pounds of Aluminum (Approx 43)5 ¾” x 4 ¾” x 140”, (Approx 22)5” x 4” x 140”, (Approx 24)1 ½” x 19” x 140”. Baker LPG Forklift w/ 2-Stage Mast. Yard Tires. Incab 1500kG Electric Pallet Mover s/n 34005. Checo 5-Ton Bridge Crane w/ Approx 60’ Span. Checo 3-Ton Bridge Crane w/ Approx 45’ Span. ¼-Ton Portable A-Frame Gantry w/ Budget Electric Hoist. Walker mdl. BPS-25 2500 Lb Cap Lifting Magnet. 1972 Consolidated Diesel Electric Co. mdl. M-792 Truck-Ambulance 1 ¼-Ton 6X6 Military Truck s/n 2252-6378C, Registration # NG058Z w/ Diesel Engine, Manual Trans, 2WD-6WD Transfer-Case. 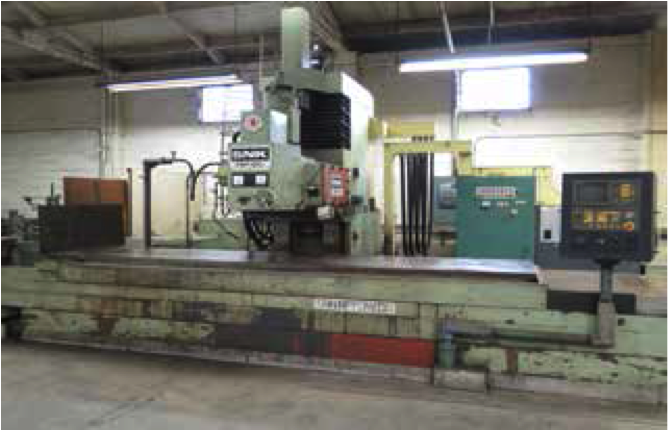 Bullard Horizontal Boring Mill s/n 31020 w/ Spaulding DRO, 8-1200 RPM, Power Feeds, 48” x 84” Table. WMW Vertical Power Mill s/n 342602-44 w/ 33.5-1800 RPM, 50-Taper Spindle, Power Feeds, 19” x 79” Table. Bridgeport Series 1 – 2Hp Vertical Mill s/n 239879 w/ Sony DRO, 60-4200 Dial RPM, Chrome Ways, 9” x 48” Table. Bridgeport Series 1 – 2Hp Vertical Mill s/n 234871 w/ Sony DRO, 60-4200 Dial RPM, Chrome Ways, 9” x 42” Table. Bridgeport Series 1 – 2Hp Vertical Mill s/n 1770 w/ Sony DRO, 60-4200 Dial RPM, Chrome Ways, 4” Riser, 9” x 42” Table. Bridgeport Vertical Mill s/n 121531 w/ 1.5Hp Motor, 60-4200 Dial RPM, 7” Riser, 9” x 42” Table. Nichols Miller Horizontal Mill w/ 9” x 30” Table, Arbor and Support. FIL mdl. FA-250 Horizontal Boring Mill s/n 32 (DISASSEMBLED). Pratt & Whitney PW-1000 Jig Boring Machine w/ 5000 RPM, Power Feeds, 12” x 24” Table (NO DRIVES). Cincinnati Milacrin mdl. 5VC-750 CNC Vertical Mill (FOR PARTS). Schaerer 39” x 104” Geared Head Gap Bed Lathe w/ 4.5-800 RPM, 42” Swing at Gap, Inch/mm Threading, Tailstock, Steady Rest, 39 ½” 4-Jaw Chuck, 20” 3-Jaw Chuck. Axelson No.20 23 ½” x 72” Geared Head Lathe w/ 9.5-1288 RPM, Inch Threading, taper Attachment, Tailstock, Steady Rest, KDK Tool Post, 15” 3-Jaw Chuck, 18” 4-Jaw Chuck. Monarch mdl. EE 10” x 20” Tool Room Lathe s/n 44682 w/ 12 ½” Max Swing, 4000 Max Variable RPM, Inch Threading, Tailstock, Steady Rest, Trava-Dial, KDK Tool Post, 8” 4-Jaw Chuck, 6” 3-Jaw Chuck, 5C Collet Closer, Coolant. LeBlond Dual Drive 15” x 46” Lathe s/n HC805 w/ 28-1800 RPM, Inch Threading, Tailstock, Mack Tool Post, 10” 3-Jaw Chuck. Hardinge mdl. HC Hand Chucker s/n HC-6884-T w/ Threading Attachment, 125-3000 RPM, 8-Station Turret, Power Feeds, 5C Collet Closer, Coolant. RPM, Power Feeds, Power Column, 24” x 30 ¼” x 19 ¾” Tooling Block. Soco mdl. MC350BP 12” Miter Cold Saw w/ Pneumatic Clamping and Feeds. Rockwell / Delta mdl. 28-3X5 20” Vertical Band Saw s/n 1594713 w/ Blade Welder, 50-4500 Variable RPM, Fence System. Delta 10” Tilting Arbor Table Saw w/ Fence System. Pexto mdl. 3381-D 12” x 22GA Power Roll s/n 10/56. Chicago mdl. BPO-314-6 36” Finger Brake s/n 300929. Burgmaster 6-Station Turret Drill Press s/n ID-733. KFF Table Model Drill Press. Haas HRT-8 4th Axis Rotary Table w/ Haas Servo Controller. Uni Dynamics mdl. 360K-12-M-L-S-OC 12” 4th Axis Rotary Table s/n 85137 w/ Mill Center (Monarch). Walker 31” Dividing Rotary Table. Volstro 90 Degree Milling Heads. Pneumatic Rotary Grinding Head w/ R8 Shank. Simco Microgrind 5C Rotary Fixture. Suburban 6” x 6” Compound Sine Magnetic Chuck. Yuasa 8” 3-Jaw Rotary Indexing Chuck. Imperial 13” Compound Rotary Table. Yuasa 10” x 10” Rotary Cross Slide Table. Yuasa 8” x 10” Compound Angle Plate. Holdridge mdl. 8-D Radii Cutter Set. Minute Man No.50 Broach Set. Vidmar and Equipto 50 and 40-Taper Tooling Cabinets. Lista and Vidmar Maple Top Work Benches. Snap-On 19-Drawer Roll-A-Way Tool Box. (5)Huot Drill and Tap Cabinets. Insert Milling, Turning and Boring Tooling, Drills, Taps, Reamers, Endmills and Perishable Tooling. Large Fixture and Angle Plates. Approximately 30,000 Pounds of Aluminum (Approx 43) 5 ¾” x 4 ¾” x 140”, (Approx 22)5” x 4” x 140”, (Approx 24)1 ½” x 19” x 140”.